Until 2012, there was no comprehensive U.S. strategy on Afghanistan. Additionally, a number of systemic issues hampered the development of the Afghan state and economic gains. After the withdrawal of most U.S. troops in 2014, the only viable option for Afghanistan's development lies in consolidating regional diplomacy. 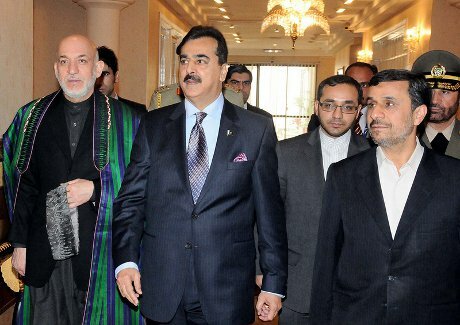 Pakistan's prime minister, Syed Yousuf Raza Gilani, along with Iran's former president, Mahmoud Ahmadinejad, and Afghanistan's president, Hamid Karzai, arrives for a meeting at the PM House in Islamabad in 2012. PPIImages/Demotix. All rights reserved. Since the International Security Assistance Force (ISAF) was formed in accordance with the Bonn Conference in December 2001, security has remained a prerequisite to economic development in Afghanistan. However, the processes of state building and of realising licit economic gains across the country have been hampered by a number of systemic issues. These ranged largely from competition between the separately integrated command and control structures of the ISAF, U.S. Special Forces, and the Afghan ministries, to the lack of U.S. political support for the most modest of non-military budgets. After President Obama withdraws most, if not all, U.S. troops in 2014, the only viable option for Afghan state building lies in consolidating regional diplomacy. During both the Bush administration and the Obama administration (up to 2012), a comprehensive U.S. strategy on Afghanistan has been absent. Policy was muddled, attention diverted by the 2003 Iraq invasion, and western expectations dashed as the Taliban continued to remain united under the leadership of Mullah Omar, despite a defensive war by the Northern Alliance to reclaim two-thirds of the state, a U.S. bombing campaign, and a massive NATO-dominated counter-insurgency. In addition, there was never any attempt by the nascent Afghan government to engage with the Taliban. Best practice for conflict resolution is to be found in allowing a third party, such as the UN, to undertake negotiations which might facilitate a peace process and eventual reconciliation. Direct negotiation is unprofessional and risky for both sides, especially when they meet on 'home' soil. The dangers of the approach were illustrated by the fatal attack against the head of the Afghan Peace Council and former president of Afghanistan, Burhanuddin Rabbani, in September 2011. In 2009, there was a concerted effort by the Obama administration to turn things around. Following the March 2009 publication of the “White Paper of the Interagency Policy Group's Report on U.S. Policy Toward Afghanistan and Pakistan”, more thought was put into economic and development issues and the advancement of a peace process. The focus on such areas ran counter to the conventional thinking prevalent amongst western governments and intergovernmental organisations since 2001. For example, after 9/11, the personal representative of the UN Secretary General for Afghanistan was ordered not to visit the Taliban again, ignoring the pragmatism of engaging with the enemy diplomatically to find a sustainable solution to the conflict. In many cases, and particularly during the surge in late 2009, the U.S. was targeting commanders in the Taliban which they should have been talking to. In so doing, the Taliban commanders were being replaced by younger and more militant Taliban members who were less likely to respond to diplomatic overtures. At the same time, western governments underestimated the role of ideology in the Taliban at mid-levels of the organisation versus disenfranchisement which could have been addressed more easily. State mediators have also contributed to the current malaise on Afghanistan, such as the inauguration of the Taliban office in Doha in June 2013 with the attendance of the Qatari deputy foreign minister. It is very unusual for a rebel movement to open a representative office. If the Taliban's objective was to be seen to rehabilitate itself before Afghan elections, it might choose to undertake confidence building gestures in Afghanistan rather than flying its own flag and competing with the government of Afghanistan in Qatar by calling itself the representative of the 'Islamic Emirate of Afghanistan'. Talks with the Taliban have been compromised by the publicity that the Taliban office had generated in Doha and in the worldwide media. The attempt at mediation has so far only led to President Karzai suspending security talks with the U.S. through leveraging the delicate position that the U.S. finds itself in now as it changes from attempting to curb the Taliban insurgency to negotiating the transfer of security immediately prior to U.S. troop withdrawal. The solution to Afghan state-building during US troop drawdown is therefore an emphasis on boosting regional security measures in tandem with US talks with the Taliban. A regional approach was recommended in the 2009 White Paper, which outlined the vital roles that Afghanistan's neighbours Pakistan, India, Iran, China and Russia should play. However, converting a U.S. White Paper into a strategy which reflects the interests of all the states involved will be much more difficult to achieve, especially when the U.S. and Iran (and possibly Pakistan) are working at cross purposes. Regional economic integration is key is generating and sustaining common interests in a post-conflict environment. Iran and Pakistan already have rail projects in Afghanistan which should soon link the three states, but more needs to be done to extract the huge iron ore deposits and tap the tourism potential of the Bamiyan Valley. The civilian surge is yet to hit the plains and mountains of Afghanistan, but before this can take place, the US must involve itself directly or indirectly (through the UN) in internal ('green on green') fights in Kabul. The US cannot assume responsibility for negotiations with the Taliban to resolve the conflict without doing more to ensure that the Afghan government has the monopoly on the use of force. There also needs to be a concerted effort to develop a failed Afghan justice system, bring warlords to trial, and help remove incompetent, corrupt, or criminal district governors. This approach should extend right up into the top echelons of the Afghan government, but with the proviso that national unity must be maintained as much as possible. In the medium term, it will largely be up to regional states—in close coordination with Afghan government strategy—that are better able to sustain an investment of time that will help build the human resource base and overcome the bulk of outstanding obstacles to state building.